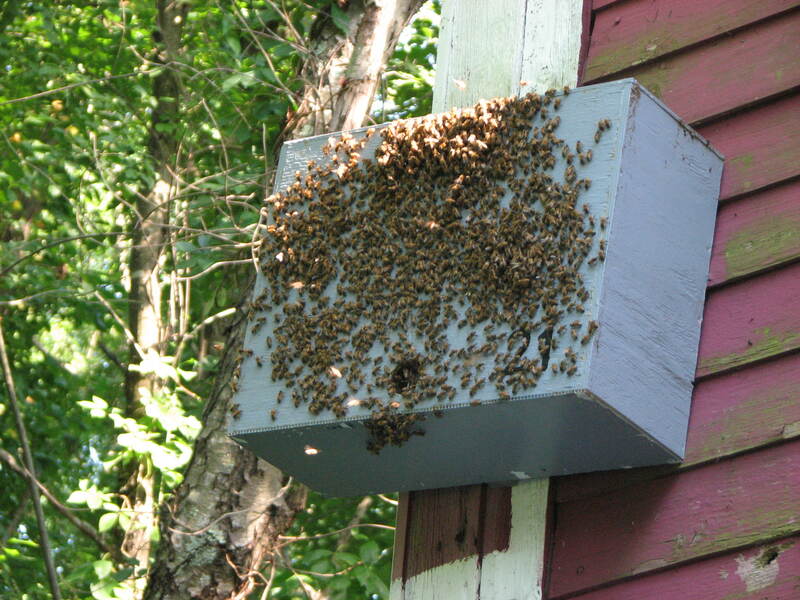 Reduce the need to even use a bee vac by using swarm traps. 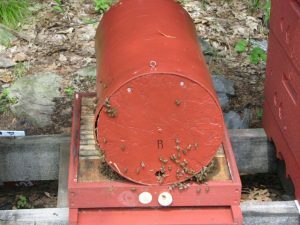 Our bee vac is by far the easiest on bees and beekeeper, but you can ease the stress even more by proactively setting out swarm traps. 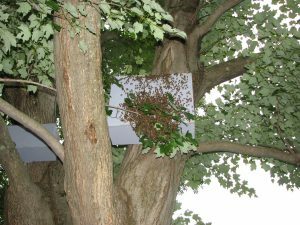 There are many options out there for swarm traps, but if ease and less stress is high on your priority list, use traps that have frames. 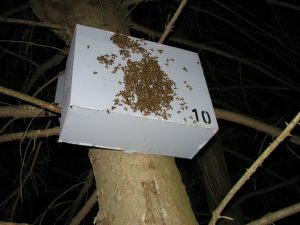 Using non-frame based traps like the compressed paper fiber pot type or even plain boxes still leave the stress and hassle of “cutting” the colony out of the trap and relocating it to a traditional hive. 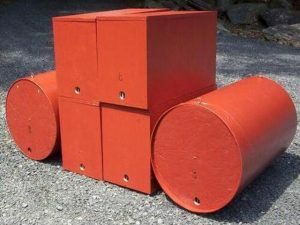 Over the last few years we have been experimenting with trap sizes and designs and have come up with one that we believe works quite well. During the summer of 2012, we put the design to a test. We set up a pair of traps in 11 different locations within a 50 mile area. Each location had a 20 litre and 30 litre trap place within 2 feet of each other. Each trap was newly built (never had bees in it) and contained 4 foundation-less frames, 1 frame of old brood comb, and one vial of our swarm lure paste. 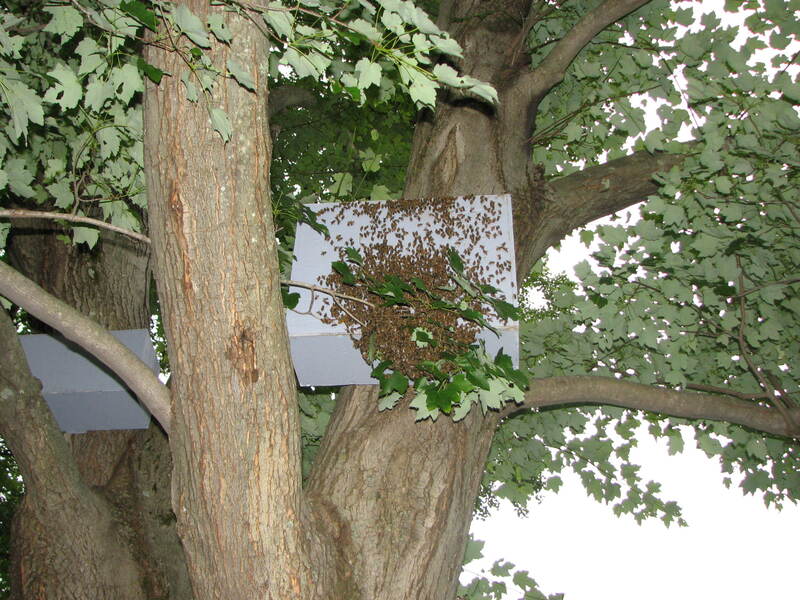 Eight of the 11 locations caught swarms, with one location catching two. Of the 9 swarms caught, 8 where in the 30L trap and only one swarm chose the 20L trap. Although the results may seem to be pretty conclusive, I must warn that I would not consider this test a valid scientific experiment. Traps orientations were dictated by the location. It was not possible to maintain consistent entrance direction, height, or relative position to other trap between the locations. In 2013, an additional experiment was done to get an idea of the effectiveness of swarm lure verses drawn comb. 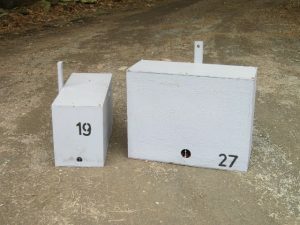 Pairs of new 30L swarm traps where put at each location. One had a vial of swarm lure and 5 foundation-less frames and the other had one old brood comb and 4 foundation-less frames (no swarm lure). Of the 11 locations, eight caught swarms and all chose the old brood comb over swarm lure. After many requests, we are now offering swarm traps with lures for sale in our Online Shop. Hi. The swarm trap I bought from you a couple of years ago is working great. (The beevac works great, too)I have since built a few and placed them on my south Texas ranch. In a matter of days they all have bees flying in and out of them. (Definitely swarm season) My question is how long do I leave them in the box before I move them to a hive or does it matter. Also, I put frames with foundation in each box. Should I have used foundation-less? One more question. I noticed in the past the bees built comb on the bottom of the frame hanging down below it. Should I build the next box more like a hive where the frame comes close to the bottom? Thanks. My question is how long do I leave them in the box before I move them to a hive or does it matter. I like to leave them in place for at least a week. This gives the queen time to start laying and locking them in. If you move them before she starts laying, the disruption may cause them to abscond. Once they have invested in brood, they are less likely to leave. It also gives them time to build the comb down far enough to catch the support wire. Once the comb incorporates the support wire, it greatly reduces the chances of comb collapse during transportation. Also, I put frames with foundation in each box. Should I have used foundation-less? Personal preference. If foundation works for you, continue to do it. My thoughts are foundation is foreign to bees, they don’t recognize it as “future comb” and would it discourage them by dividing up the cavity too much. Also it is an added expense. I noticed in the past the bees built comb on the bottom of the frame hanging down below it. Should I build the next box more like a hive where the frame comes close to the bottom? 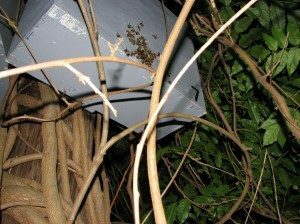 Cavity volume is one of the key things when a swarm hunts out a new nest site. I believe Seeley found that 40L is the optimal size. I found 40L to be too big to easily handle and found 30L provides good results. To me it is key to provide frames for the bees to invest their comb building efforts. You could make the box wider to hold more frames, but that also makes it less manageable when up on a ladder. I would much rather scrap the excess comb off the bottom of the frames, then have them swarm again. In my environment, with 4 foundationless frames, I can let them go a month before I have to worry about them being overcrowded. Depending on the size of the swarm, most can stay 2-3 weeks before they start building comb below the frames. When constructing the Bushkill swarm traps, do you use a specific size screw or nail? Nail gun? I us 1/4″ crown staples. 1″ long.